A while ago we made these booklets for our Noah’s Ark lesson. We chose it because of the rainbow, but it really encompasses more than just that one story. 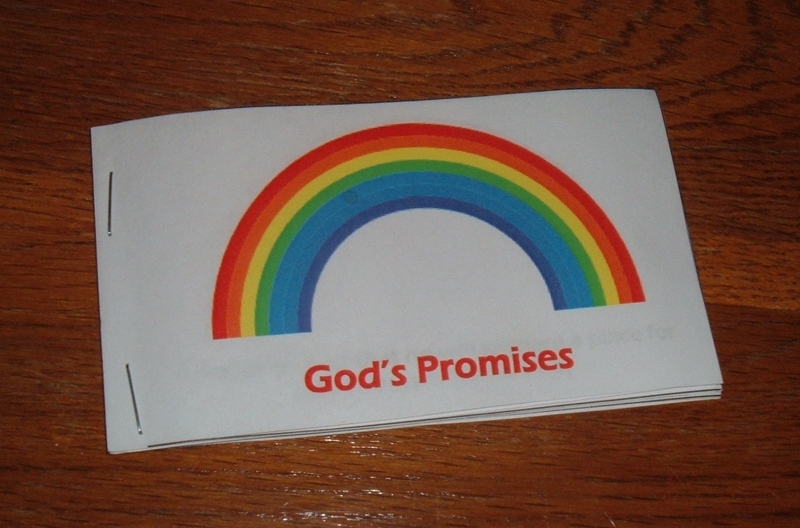 It has a series of God’s promises printed inside; promises he made at different times to different people. The booklet can be downloaded at Ministry-To-Children. For the little kids, I cut out the pages and stacked like ones together. Then I set them out going in a line across the front of the table. The kids went down the buffet of pages, gathering one of each. At the end we squared up the stack and stapled them. I suggest sending kids through the line one or two at a time to eliminate the mad grabbing and to make it easier for the person stapling.